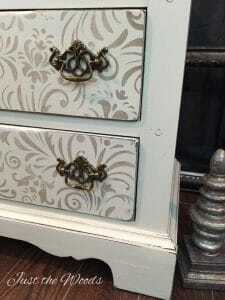 This vintage painted shabby chic stenciled dresser makes me want to hashtag! #shabby #chic # romantic #classic #elegant #classy #regal #cream #luxury.. OK OK. I’ll stop. 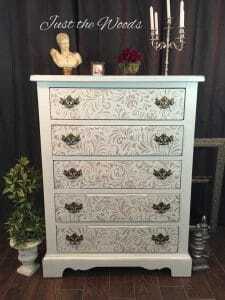 But on a serious note, I love how this stenciled dresser transformed from boring to beautiful. Sometimes it’s those ugly ducklings that really surprise you. 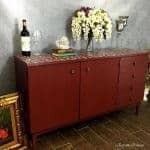 This chunky vintage dresser from the 1970s has good ‘bones’ but was boring. I wanted to make it beautiful yet elegant. From looking at the ‘before’ photo it seems hard to imagine this piece looking anywhere near elegant but I’m a determined artist. 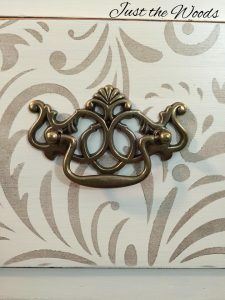 As much as I normally like to keep the original vintage hardware when possible I decided that these pulls had to go! I must have dozens of this style in my shop, I’m simply not a fan. 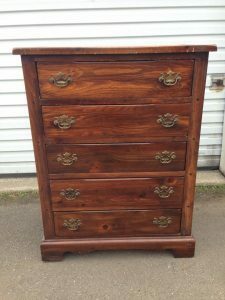 One cool thing about this dresser is that it already has its own special characteristics before I even touched it. 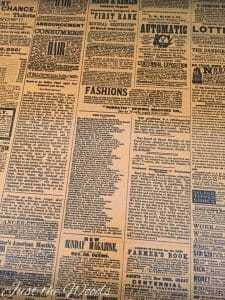 Inside the spacious clean drawers are a newspaper print lining the bottoms. How cool is that? 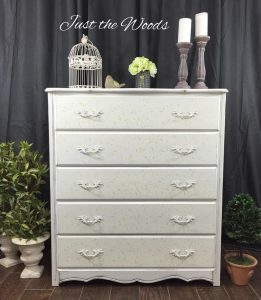 After prepping the vintage dresser it was painted with a neutral antique white base and then a gorgeous stencil design was added to the drawer fronts in a soft gold. 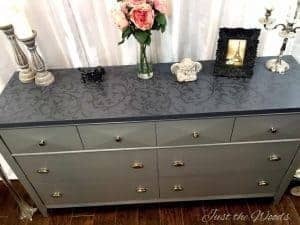 The hardware was replaced with awesome Chippendale style pulls from D. Lawless Hardware making this chunky boring dresser a new elegant and romantic piece. 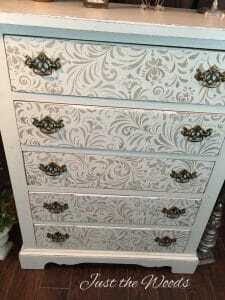 The stenciled dresser was also distressed along the edges for a shabby chic feel. 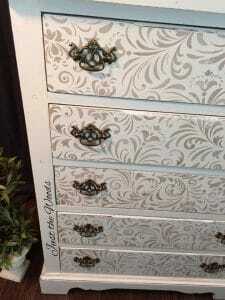 This stenciled dresser makes me feel like I’m staying in a fancy luxury hotel somewhere… Paris maybe? A girl can daydream for now. 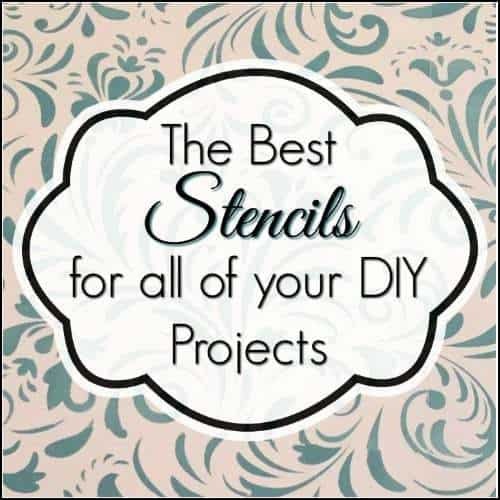 If you love this stencil you can find amazing stencils for furniture (HERE). 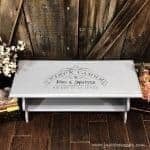 Your stenciling is lovely, Kandice! 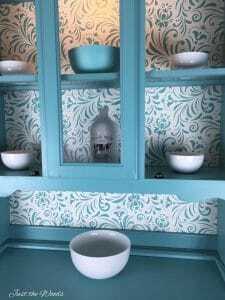 Love the color combination, too – just beautiful! Found you at Knick of Time’s Vintage Inspiration Party. Have a great week! 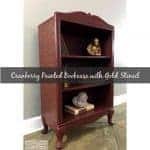 Thank you for linking up at Friday’s furniture fix. I wish we could each feature more than one piece. You did a fabulous job on it and it is definitely one of my favourites! I could not resist commenting. Perfect! Love your piece. Exactly what is the name of the stencil you used? thank you Sue. TO be honest I don’t remember, Im so sorry.